The National Association of Concessionaires (NAC) is now seeking nominations for the 2019 Mickey Warner Award. Submissions are due by February 4, 2019. 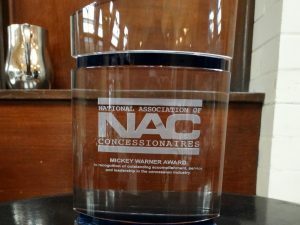 The Mickey Warner Award is bestowed upon an individual each year by NAC to recognize leadership and significant accomplishments in the non-movie concession industry. 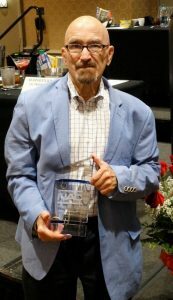 The award honors the late Mickey Warner, the father of the NAC Concession Manager Certification Program and one of the greatest innovators and educators of the concessions industry. The 2019 award will be presented at the NAC Concession & Hospitality EXPO on August 1 in Chicago. Election of the honoree will be by the NAC Executive Committee. 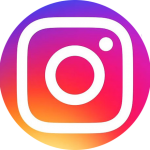 Past recipients include: Shelly Feldman of Shelly Feldman Associates (2002), Walter Dunn of the Coca-Cola Company (2003), Frank Liberto of Ricos Products Company (2004), Jeremy M. Jacobs of the Delaware North Companies (2005), Chris Bigelow of Bigelow Companies (2006), Phil Noyes of Proof of the Pudding (2007), Ken Young of Ovations Food Service (2008), Charlie Cretors of C. Cretors and Company (2009), Gary Horvath of Ovations Food Service (2010), J. C. Evans of Gold Medal Products (2011), Larry Etter of Malco Theatres (2012),Terry Conlon of the University of Illinois (2013), Gary Wattie of Centerplate (2014), Dan Kroeger of Gold Medal (2015), Charlie Neary of Spectra Comcast Spectacor (2016), Joe Joyce of Playhouse Square (2017) and Jon Muscalo of Legends Hospitality Management (2018).